The sounds of the holiday season will once again be shared at 7 p.m. Dec. 16 at the annual Fulton Community Band Christmas Concert in the G. Ray Bodley High School auditorium. 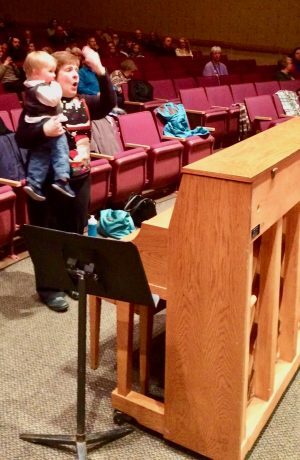 Dolores Walrath, pictured, conducts the Christmas sing-along at the 2017 concert with help from her grandson, Wyatt Wihera. FULTON – The sounds of the holiday season will once again be shared at 7 p.m. on Dec. 16 at the annual Fulton Community Band Christmas Concert in the G. Ray Bodley High School auditorium. The concert is free and FMA is providing free bus transportation to and from the concert for residents of Towpath Towers, Fulton Mill Apartments, Meadowbrook and Emery Grove. 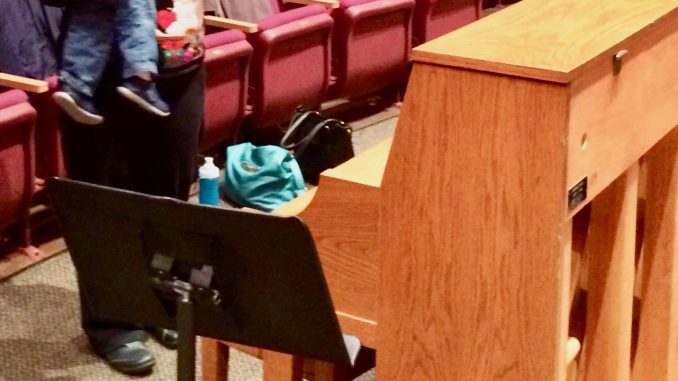 “The evening will end with a rousing Christmas carol sing-along with the band, the choir and the audience,” said Steve Chirello, president of the Fulton Music Association..
Everyone in the community is invited to attend this free concert, Chirello said. For additional information, call 591-3392.